If you’re like most religion reporters, you dread the holidays, when editors demand yet another Christmas/Hanukkah/Kwanzaa/Festivus/solstice story. This edition of ReligionLink is chock-full of ideas to get you through another year. No mo ho-ho-hum holiday stories! There is a growing acceptance among some atheists, humanists and other nonbelievers for their own December holiday, complete with traditions, rituals and decorations. Some mark Newtonmas — the Dec. 25 birthday of Sir Isaac Newton — while others mark HumanLight — a humanist celebration of the solstice. Newest is Secular Solstice, born in New York City just a year ago and now spreading to other communities around the world. 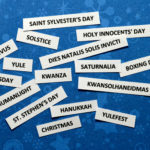 Why do the nonreligious want their own holidays? How do they create their own traditions and rituals? With or without borrowing from religious traditions? How are nonbelievers in your area celebrating in December? Read an Oct. 12, 2014, blog post at Daylight Atheism about the origins of Secular Solstice. Read a Dec. 20, 2013, New York Times story about the first Secular Solstice in New York City. Read a Dec. 22, 2012, Religion News Service story posted by The Huffington Post about the celebration of HumanLight by humanist communities around the U.S.
Read a Dec. 16, 2011, Religion News Service story in USA Today about the celebration of Newtonmas. Raymond Arnold is a New York-based humanist activist and organizer of the first Secular Solstice service, a December celebration for atheists, humanists and other nonbelievers that incorporates light, darkness, ritual and song. Tom Flynn is executive director of the Council for Secular Humanism and director of the Robert Green Ingersoll Birthplace Museum, America’s only freethought museum. He is also editor/publisher of Free Inquiry, the world’s largest-circulation secular humanist magazine, and editor of The New Encyclopedia of Unbelief. Flynn is based in Amherst, N.Y.
Flynn has written many essays and opinion pieces arguing that atheists and humanists should not borrow anything from religion for their holiday observances. Contact: tflynn@centerforinquiry.net, 716-636-7571 ext. 213. Roy Speckhardt is executive director of the American Humanist Association, a nonprofit organization in Washington, D.C., that works on behalf of the nontheistic community. He can discuss the foundation of HumanLight as a humanist holiday. What makes a good Hanukkah song? Quick — name one Hanukkah song besides “Dreidel, Dreidel, Dreidel” or Adam Sandler’s hilarious “The Hanukkah Song.” But there are a lot of good Hanukkah songs out there, many of them contemporary compositions. What makes a good, memorable Hanukkah song? Can Hanukkah songs hope to compete with popular Christmas songs? Should they? What Hanukkah songs do people in your area listen to? ReformJudaism.org maintains a list of “11 Great, Modern Hanukkah Songs” that includes works by Josh Nelson, Matisyahu and The LeeVees. Lisa Cavanaugh: Lisa Cavanaugh is an assistant professor in the business school at the University of Southern California in Los Angeles. She is an expert on how holiday music influences shopping and has shown that secular holiday music leads consumers to spend more. Contact 213-740-1150, lisacava@marshall.usc.edu. Robert Harris: Robert Harris is an associate professor of Bible at the Jewish Theological Seminary in New York City, where he teaches biblical literature and commentary. He is also a musician with the garage band Shake, Rabbis and Roll and composes many of the band’s songs. Not to be missed: the group’s second CD, titled Keep Your Day Job. He also composes many songs for Hebrew musicals performed at a Jewish summer camp in Wisconsin. Call the guy already — 212-280-6144, roharris@jtsa.edu. The Maccabeats: The Maccabeats are a male a cappella group that originated among students at Yeshiva University. The Maccabeats have composed new lyrics to old songs for various Jewish holidays, including Hanukkah (“Shine”). Contact via their website. A Charlie Brown Christmas debuted in 1965 and hasn’t missed a year on the air since. Fans say its message of anti-consumerism and anti-materialism still resonates today. But what about its religious message — remember blanket-toting Linus reading from Luke? Would A Charlie Brown Christmas get made today? Read a transcript of a Dec. 1, 2014, NPR story about the 50th consecutive airing of A Charlie Brown Christmas. Read an essay by Dennis R. Hoover in the Summer 2000 edition of Religion in the News about religious themes throughout the work of Charles M. Schulz. Gina Huntsinger: Gina Huntsinger is marketing director of the Charles M. Schulz Museum in Santa Rosa, Calif., and can connect reporters with museum officials. Contact 707-579-4452 ext. 268, gina@schulzmuseum.org. Stephen Lind is a visiting professor of business administration at Washington and Lee University in Lexington, Va. He is the author of a forthcoming book about religion in the work of Charles M. Schulz. Mark I. Pinsky is an author and longtime journalist who covered the religion beat for many years. His books include Amazing Gifts: Stories of Faith, Disability and Inclusion; A Jew Among the Evangelicals: A Guide for the Perplexed; and The Gospel According to the Simpsons: The Spiritual Life of the World’s Most Animated Family. Pinsky lives in suburban Orlando, Fla. Contact through publicist Kelly Hughes. Pinsky can also discuss religion in Peanuts and A Charlie Brown Christmas and its place in the history of cartoons with religious themes. In the wake of the killings of multiple African-American men by white police officers, clergy from around the country have joined protests, called for peace and reconciliation and crafted sermons on the subject. With the decisions of two grand juries — one in Ferguson, Mo., and one in New York — not to indict officers involved in the deaths of Michael Brown and Eric Garner coming near Thanksgiving and Christmas, clergy are speaking out even more. How might the deaths of these men — and others in Cleveland, Phoenix and Los Angeles — affect holiday services, sermons and celebrations around the country? Read a Nov. 25, 2014, story by The Associated Press about clergy protesting in Ferguson. Read an Oct. 10, 2014, ProPublica report analyzing police shootings of black males. Enger Muteteke: Enger Muteteke is an assistant pastor at Glen Burnie United Methodist Church in Glen Burnie, Md. She wrote an essay about how the Ferguson grand jury decision is affecting her this holiday. Contact 410-761-4381. Clayborne Carson is a Stanford University history professor and founding director of the Martin Luther King Jr. Research and Education Institute. He is an expert on the interface between faith and social justice. The Rev. Al Sharpton was a child preacher and was ordained as a minister at age 10. He has been organizing for social justice causes since he was a teenager and has run for U.S. Senate, for mayor of New York and for president of the U.S. He is host of The Al Sharpton Show, a radio talk show. Sharpton, once entertainer James Brown’s road manager, is known to many as a leader, to others as a divisive critic and to all as a power broker. He wrote Go & Tell the Pharaoh: The Autobiography of Reverend Al Sharpton. Contact him through Rachel Nordlinger. Rabbi Rolando Matalon heads the Conservative Congregation B’nai Jeshurun in New York City. He has been part of a team of rabbis that brought this synagogue from the verge of closing to a current membership of 1,800 households. He has brought his focus on social justice and peace to the forefront at B’nai Jeshurun. He and several other rabbis from B’nai Jeshurun and other New York synagogues have protested the finding of the New York grand jury in the death of Eric Garner. A generation ago, Advent was primarily a children’s celebration in many churches. Think wreaths made from dyed cornflakes on paper plates, with Red Hots for berries. Now, it is not only a time when many adults reflect on serious subjects — social justice, sacrifice, poverty and more — but a time to do something about them. So-called Advent activism has taken off in a number of Christian denominations and shows no signs of slowing down. How will churches in your area conduct their own Advent activism? What’s responsible for this change in approach to the time of Christmas preparation? Transform, a Christian missional community in Charlottesville, N.C., is promoting #StayWokeAdvent, dedicated to social justice issues highlighted by the events in Ferguson, Mo. Read an undated blog post by Rachel Held Evans about Advent activities that includes activism (#9). Lisa Anderson: Lisa Anderson is senior director of intersectional engagement and strategic convening at Auburn Theological Seminary in New York. In 2010, she wrote a guide to incorporating activism into Advent. Contact 212-870-3157, landerson@auburnseminary.org. Steve White and Holly Roach: Steve White and Holly Roach are the co-directors of Transform. Contact 505-554-7133, steve@transformnetwork.org, holly@transformnetwork.org. Rachel Held Evans is a popular blogger and the author of A Year of Biblical Womanhood, in which she explored the meaning of “biblical womanhood” as it is understood by many complementarian and egalitarian Christians. She lives in Dayton, Tenn. Contact via her publicist. Evangelicals did not always celebrate Advent with great fervor; it was often seen as too “high church.” But in recent years, some evangelicals have embraced the season. Why? How did this change come about? How will evangelicals in your community mark Advent? What does it mean to them? Read a Dec. 1, 2014, Time magazine story about evangelical pastor Louie Giglio’s new book on Advent and evangelicals. Read an undated exchange on The Christian Post between Kerry Shook and Darrell Bock about evangelicals who celebrate Advent. Read a Nov. 24, 2008, USA Today story about the growing number of evangelicals who celebrate Advent. Louie Giglio: Louie Giglio is pastor of Passion City Church in Atlanta. Contact 1-800-555-5241. Darrell L. Bock is a well known author of over 30 books exploring biblical topics and earned international recognition as a Humboldt Scholar (Tübingen University in Germany), for his work in Luke-Acts, historical Jesus study, biblical theology, as well as with messianic Jewish ministries. Kerry Shook is pastor of Woodlands Church in Houston, where members are encouraged to tweet during sermons.